Suddenly remembers where his seat is located. 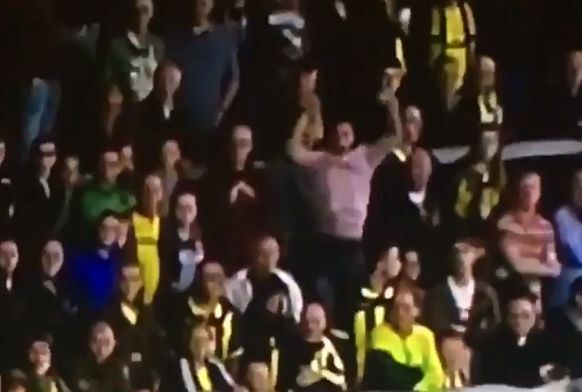 Watch as an apparent Birmingham fan in the home end at Burton Albion cuts short his celebration following a goal for the visitors, after seeming to suddenly remember where his seat for the Championship game under the lights on Friday night was located. Jacques Maghoma’s 29th minute opener was cheered by the travelling supporters down the other end of the pitch at the Pirelli Stadium but also one man caught on camera in the stand behind the goal who appeared to jump into the air before managing to reign himself in. The Birmingham City fan’s celebratory leap was aborted and he can be seen looking round to see if anyone noticed his indiscretion. In the end the supporter was to go home disappointed though, as Burton recovered to clinch a 2-1 win.